Past Projects | UCLA Women's Club Basketball Inaugural Season Fundraiser!! Our crowdfunding campaign has ended, but you can still support UCLA Women's Club Basketball by clicking here. UCLA Women's Club Basketball Inaugural Season Fundraiser!! In early 2017, a small group of UCLA students gathered in Pauley Pavilion with a shared love of basketball and a desire to play at a competitive level. One year later, the UCLA Women's Club Basketball Team has officially been formed. This hardworking group of girls is determined to create a presence on campus and is quickly becoming one of the most competitive Women's Club Basketball programs on the West Coast - but they need your help! With the creation of a new program comes many costs: travel, referees, tournament fees, and uniforms are a few of the many costs that come up as we try and get our program up and running. We are doing everything we can to make our program as successful as possible, but would be so appreciative of any support we can get! Without an established group of alumni, finding donations for our fees has proven difficult, and as a group of full-time college students, any help goes a long way! Please consider making a donation to our program in any amount to support our efforts to establish the team as a program on campus and to help us achieve our goals as we begin to compete against other programs in the new year. Check out our "levels" section to see just what your donation can give to us - even a little goes such a long way and allows us to build and succeed! Thank you so much for your time . . . we hope to see you at a game soon! Go Bruins! 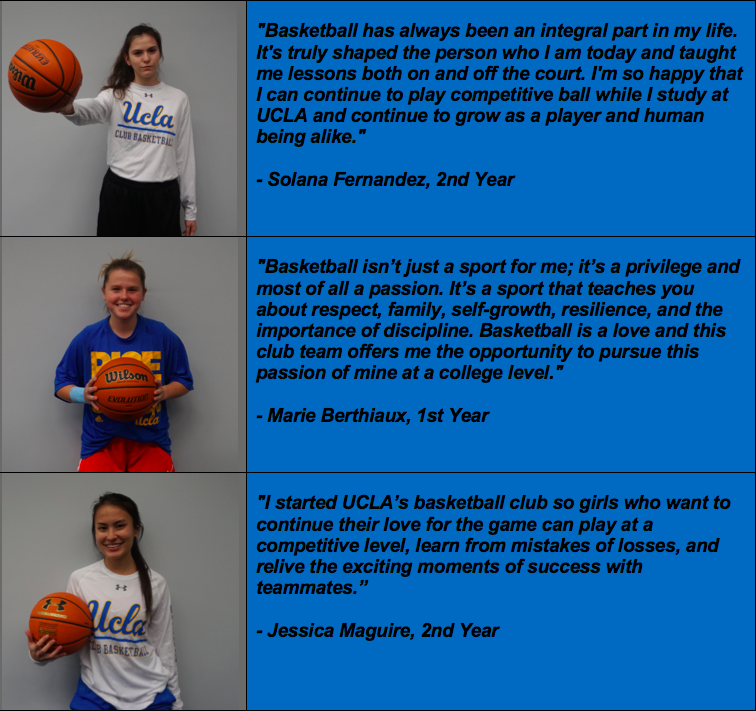 The girls of UCLA Women's Club Basketball all share a love for the sport. Each individual played high school varsity and wishes to continue to compete while furthering their education across a broad pool of majors including sociology, psychology, MIMG, bioengineering, biology, political science, and MCDP. All of these Bruins are hardworking and passionate, both in their studies and on the court. Support our passion and donate today! Your donation will directly go towards the demanding expenses of the club. In return, we promise to work hard and pursue victory with honor. 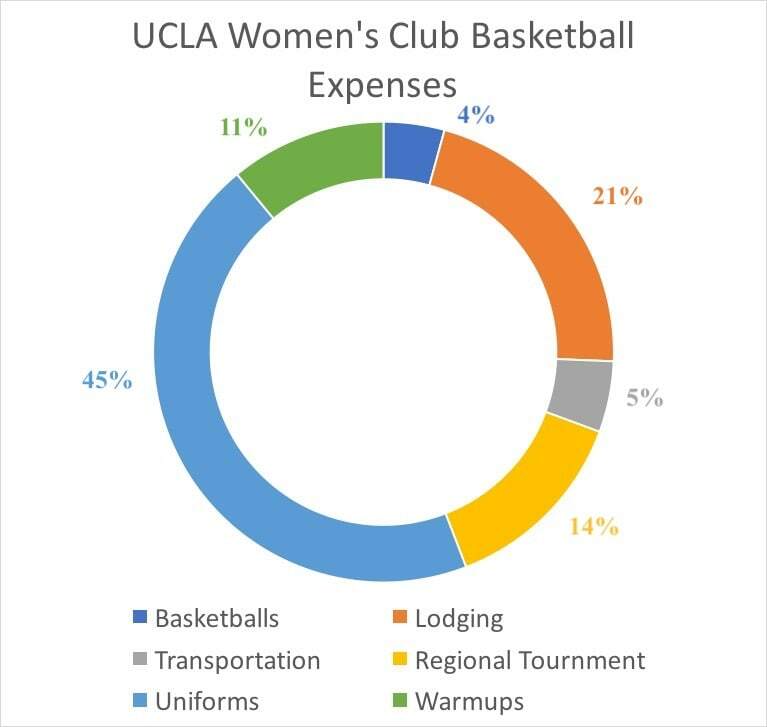 As a very young club (established in 2017), the UCLA Women's Club Basketball program lacks many resources, including experience, gear, and an alumni base. In these early years, we must strive to build our program well. We aim to raise money to help cover this season's expenses and create a strong foundation for the future years of the program. Club basketball requires expenses for articles such as equipment (uniforms, gear, basketballs), tournament fees, travel costs (transportation, lodging, food), in addition to a myriad of other items. With a minimal or nonexistent budget, running the program is impossible. A donation, however, can help the club basketball girls compete and fulfill their passions. 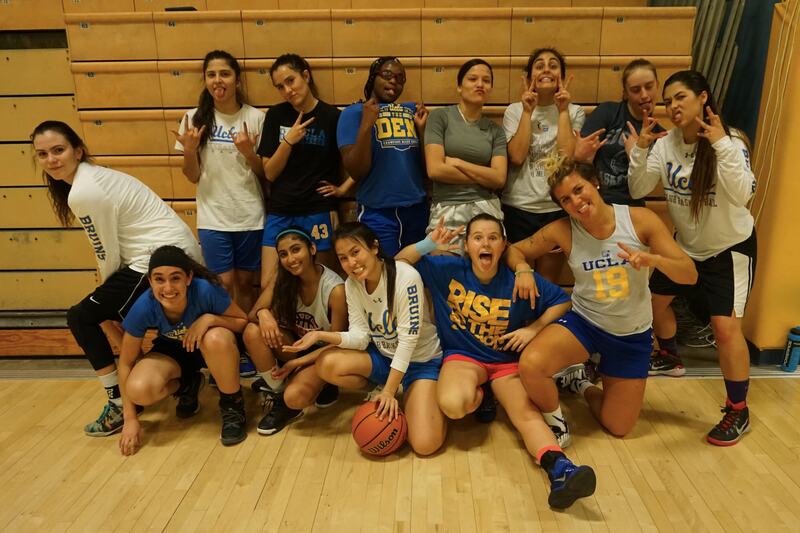 This season, the UCLA Women's Club Basketball plans to drive to Sacramento, California for the NIRSA Regional Basketball Championships hosted by Sacramento State University from February 23-25. In order to accomplish this, we must find a means to cover transportation, lodging, and tournament fees. Aid us with competing at the regional level so that we may have a chance to be the champion! If we are triumphant, we earn a spot in the NIRSA National Basketball Tournament at Ohio State in April . . .
Help us fight our way to victory!!! We Thank You So Much For Your Generous Donation! We dedicate our season to you! Go Bruins! An important item for basketball is, well, a basketball! As a young club, we do not have many resources, which includes basketballs to use for practice and play. It is imperative that we have basketballs in order to play basketball! Donating $22 can pay for a Bruin's warmup shirt! Help us represent the UCLA Bruins as we get ready for our games. For the NISA Regionals Championship Tournament, expenses include paying for a place to sleep. Teammates will share quad occupancy hotel rooms while they travel for competition. For $35, you can pay for a one night stay for one player! The UCLA Women's Club Basketball team will be driving to Sacramento, California for the NIRSA Regional Tournament. This requires car rentals. A donation of $70 contributes one rental car for the team. As a team, UCLA Women's Basketball needs team uniforms. Contributing $90 purchases one jersey, so that a player can represent the UCLA Bruins accordingly as she competes! For the NIRSA Regionals Championship Tournament, expenses include paying for a place to sleep. Teammates will share quad occupancy hotel rooms while they travel for competition. For $140, you can pay for a one night stay for four players! UCLA Women's Club Basketball intends to attend the NIRSA Championship Shootout (A Regional Tournament) hosted by Sacramento State University. In order to participate, the club must pay a tournament fee. Help contribute so that we may travel to Sacramento and contend with other competitive club teams!